Oman's Ministry of Heritage & Culture (MHC) in cooperation with Blue Water Recoveries Ltd (BWR) of West Sussex, UK announce the discovery and archaeological excavation of a Portuguese East Indiaman that was part of Vasco da Gama's 1502-1503 Armada toIndia. The ship, which sank in a storm in May 1503 off the coast of Al Hallaniyah island in Oman's Dhofar region, is the earliest ship from Europe's Age of Discovery ever to be found and scientfically investigated by a team of archaeologists and other experts. 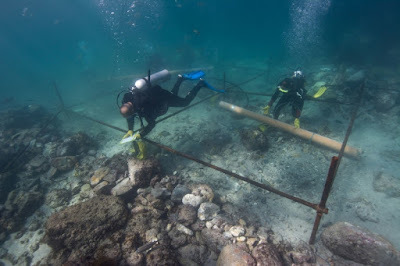 The wreck site was initially discovered by BWR in 1998, on the 500th anniversary of Vasco da Gama's epic discovery of the direct sea route to India, but full-scale archaeological survey and excavation by the MHC didn't begin until 2013. Since then two more excavations have been conducted in 2014 and 2015, with more than 2,800 artefacts being recovered. The project has been jointly managed by the MHC and David L. Mearns of BWR and has been conducted in strict compliance with the UNESCO Convention for the Protection of Underwater Cultural Heritage of 2001.
an important copper-alloy disc marked with the Portuguese royal coat of arms and an esfera armilar (armillary sphere) - a personal emblem of Dom Manuel I.
an extraordinarily rare silver coin, called the Indio, commissioned by Dom Manuel in 1499 specifically for trade with India. The extreme rarity of the Indio (there is only one other known example in the world) is such that it has legendary status as the 'lost' or 'ghost' coin of Dom Manuel. His Excellency Hassan Al Lawati the Adviser to the Minister For Heritage Affairs comments: "This project is regarded as the first that is conducted in Oman and the region in underwater archaeology. Therefore, the Ministry has taken a proactive approach to ensure that the project will be efficiently conducted. This was done by involving the expertise in underwater archaeology and by working under international regulations such as the UNESCO convention of 2001. We appreciate the joint efforts of the local and international entities and institutes that made this project a huge success." 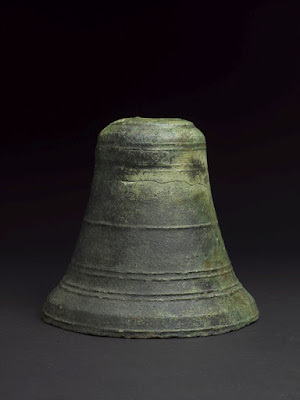 "This project differs from the majority of maritime archaeology projects in that we set out to specifically find the wreck site of the Sodré ships, using a suvivor's and other historical accounts, because of their very early age and the potential they held for new discoveries. It is extremely gratifying therefore that this strategy has paid off with such interesting revelations even though we are still at a relatively early stage in the study of the artefact assemblage," said Project Director David L. Mearns.